Sometimes it?s mostly re-runs. But still, Michael Bennett was there. Were you? Erie Reader works ceaselessly to keep you informed of the shows and events you should put your full faith and effort into seeing, but we?d also like to present you the opportunity to kick yourself for missing a great show. Or perhaps spark your interest enough to catch a group the next time they play. Or, on occasion, commiserate with the writer about the failed journey into an abomination of a night where all you wanted was good music, but nothing was delivered. There are moments in the Erie scene when the same bands are out playing again and again. It?s like the lull between TV seasons, when there are no new shows, but the reruns will keep you entertained. This is one of those times. The time of year when the musical landscape is gearing up for the big push, the big Halloween bashes are planned, and the night before Thanksgiving looms large. In the meantime, you will still be entertained, but it makes lousy copy. With that caveat, let?s play America?s favorite game: We Were There? Boom Bap! Just like that. Hip Hop has the potential to move you?mind, body, and soul. It is with that understanding that 2189 and Gimp Guy Underground brought acts from Buffalo, Pittsburgh, and Erie to the new all-ages venue to reach out to the underserved, beat-deprived masses. This show kicked off what will be a monthly event of regional hip hop acts and local talent. The flavor was not just reserved for the MCs. Local b boys and b girls danced and bobbed and worked themselves into that happy place where rhythm and rhyme push out all the troubles and worries. Mic and Life of Buffalo?s Essential Vitamins Crew brought lyrical clarity to match the sustained energy of Fortified Phonetx of Pittsburgh. Local artists Heresy and Profound Produce kept the crowd engaged and brought fresh perspective to match fresher beats. Aside from the great acts on the bill, the true highlight was the local talent on the floor. Breakdancing is not dead. Shabadoo indeed. When did Eric Brewer and Friends become the best cover band in Erie? Just curious. Their set included covers of Lennon, Petty, The Band, and The Dead. Now, before I go off on a rambling tangent about covers verses originals, I can say that when Brewer et al. get into someone else?s song, they actually find a way to leave their own signature on it. The music and lyrics stay true to the original, but the jams and solos are wholly their own. You may have read about Eric Brewer in the cover story a couple of weeks back, but don?t be fooled. Even with all of Brewer?s talent, it is the And Friends that keep the party moving. Steve Barone on drums and Ralph ?White Chocolate? Reitinger on bass provide all the backing and bottom any musician could want. A great highlight of this performance included a fantastic solo by Barone while Brewer and saxophonist Joe Cieslak accentuated the beats on Reitinger?s bass. Cool scene. And let?s not forget the fast moving fingers of the great Charlie Meyer. The keyboard player is underrated in a talented band, but his sound makes the whole thing work. Yes, the crowd danced. Yes, the music was great. But covers? I thought they were an original band. But I?ve been known to be wrong. The Tradesmen are a great local band that doesn?t get enough local stage time. 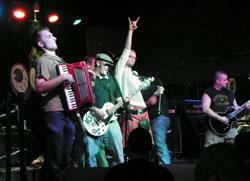 They are a great punk rock outfit, fitted for originality with the addition of accordion and bagpipes. Of course comparisons to the Dropkick Murphy?s will persist, but they would be inaccurate. The band infuses the audience with energy, and on this night they killed it on The crooked i stage. My 3 Scum. Enough said. Old school punk, from old school punks. The God Bullies had their time. It just happened to by 1990. Their albums from that period are great. Combining hard driving music, angry lyrics, and samples of words of wisdom. On this night they looked tired, beat down, and out of sorts. The music was interesting, but did not win over the hearts and minds of the audience. There was great theatrical fare, but it seemed too rehearsed, too limiting. Dropped in to see the Eerie Roller Girls in their first home match. It was exciting, even if I had no real idea what was going on. It?s just a cool thing to be happening in Erie and I?m more than down to support the action. Stay tuned to Erie Reader to read Jay Stevens? profile on the roller girls. All I can say is chicks on wheels hitting each other. What more do you need to know? I caught the return of Joe Buck Yourself on stage at The i, and his lyrical style is incredible. His words struck me with every refrain. ?Maybe we?ve lost our faith/ We?re all illiterate/ There is no art.? The man speaks truth. The fact that he looks like the poet Jim Carroll somehow mated with the guy from Hellraiser, sans pins, should only make you more interested in his performance. To repeat, these last two weeks were full of reruns. Abadon Faluz and Lunch $ played again, Brewer and Friends played again. Birdsong played again? Thankfully Rochester is only a few hours away and could deliver RootsCollider to Erie. If you missed it, and judging by the crowd you did, you missed a great time. Live drum and bass, no frills just straight on intensity. They should come back to Erie, and when they do you should be there. I detest when people put down local talent. The same people who think you need to go out of town to be entertained or pay huge covers or ticket prices to be properly rocked. If you believe this, why are you even reading this column? And why won?t you fall off your high horse and enjoy what Erie has to offer? Case in point: Invitation to the Blues: A Tribute to Tom Waits at The crooked i. Lest you think I?m backing down on my cover band hate, I?m not. Tribute shows trump cover bands every time. Especially when it involves the words Tom and Waits. I missed Matt Texter?s set. And I am disappointed, but my friends like to be hygienic for some reason, so we were running a bit late for the show. I did arrive in time for the most anticipated act of the night Small Change. Doug Phillips is a man of immense talent, and this night removed any doubt of that fact. It did help he had a killer band with him. Phillips did a great job working into Waits? soul, then back to Phillips? then back to Waits?. The man knew what he was doing. And he truly couldn?t have had better backing. Sheldon Peterson on guitar, David Blaetz on upright bass, and Rik Cass on kit were phenomenal. They also played the only full set of Waits tunes. Aggressive. That is the music of Johnny James And The Absolutes. They killed it. And their take on Waits was outstanding. Is What It Is ended the show, as well they should have. Do they ever have an off night? Not in my experience. Ian Smith?s take on ?Red Shoes By The Drugstore? may be the most entertaining thing I?ve ever seen him do? on stage anyway. Michael Bennett believes in SYLS. Support Your Local Scene.